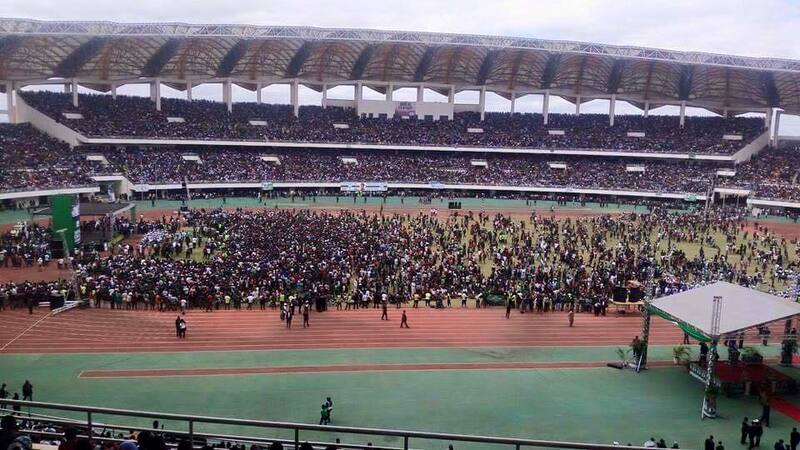 The PF has filled Disaster stadium full and people were made to sit on the pitch itself by 13 hours. Outgoing president Edgar Lungu is set to launch his campaign at the stadium today. But most of these people are not genuine PF supporters, most have turned up to listen to music as the PF has advertised that a lot local singers will be performing. And this being a weekend, most people have nothing to do so they have gone to the stadium hoping that maybe they can be noticed by one of the PF officials dishing out money. Moreover, from 2008, this had been a PF stronghold so the PF still have some remnant support. And we are talking about the whole government machinery being involved in ferrying cadres from all the country plus people like bishop Joshua Jere have forced their followers to attend or they will not have blessings anymore. From what the Watchdog is monitoring so far, the UPND will have a similar if not bigger crowd despite holding their rally in a former PF stronghold Kitwe, having no government machinery to abuse and one of the key figures GBM is organising the rally while running away from the police set on him by the PF.